I grew up in Cedar Falls, Iowa, across the street from a man named Terry Stumpf. In late 1979/early 1980 we traveled to Medicine Lodge, Kansas, to pick up one of the 50 cars. It was a roller, the original drive train having been long separated from the car. Upon our return to Iowa, the car was stripped of the multicolored paint it had acquired, and returned to Wimbledon White. 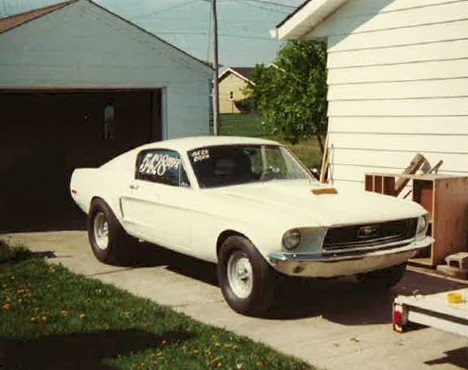 Terry raced it at NEITA Raceway/Cedar Falls Raceway with the 428 that he had been using to race his original owner Talladega. At some point early in the ownership of the car, the crank damper inertia ring let go and ventilated the hood. At this time a fiberglass hood was installed on the car. The car was back-halved in the 1980s and had a cage installed; I believe that the chassis work was done after the damper explosion. The powerplant was changed to a 429/460 during this time. I left Cedar Falls in early '86. Terry was still racing the car with the Lima motor. The car was lost in an accident at the track in which Terry died. It was my understanding that the crank broke, causing damage to the trans which oiled down the slicks resulting in loss of control. Cedar Falls Raceway honors Terry each year with a race in his name. One thing that stood out to me at the time we picked the car up was that it had a 3-point roll bar in it, and Cragar Supertrick wheels on it.... also seems like it was a sealer delete car, but it's been a LONG time. I recall the 8000 RPM tach, as my brother had a 68 coupe and there were discussions regarding liberating the tach from the race car (didn't happen).